The new wife of a brilliant scientist uncovers his dark secret. There's a moment in Orson Welles' recently, belatedly released The Other Side of the Wind in which the central filmmaker played by John Huston is asked whether it's okay to steal from other artists. His response is to acknowledge approval of stealing from others, but warns that you should never steal from yourself. There probably isn't a filmmaker alive who hasn't stolen from a prior work, whether consciously or subconsciously, and let's face it, anything that appears innovative today was probably already rendered in a silent movie a century ago. The trick is to steal from the greats, yet make it feel fresh, something writer/director Sebastian Gutierrez pulls off with his sci-fi thriller Elizabeth Harvest. In what might be the most derivative movie of 2018, Gutierrez steals/borrows elements from Rebecca, Blade Runner and Groundhog Day among others, but weaves those constituent parts into what plays like a genuinely original piece of work. Millionaire scientist Henry (Ciarán Hinds) brings his new bride, the considerably younger Elizabeth (Abbey Lee), home to his own version of Manderley, a remote high-tech home not unlike that of Oscar Isaac's similarly sinister techy in Ex Machina. There's even a Mrs Danvers surrogate in housekeeper Claire (Carla Gugino), aided by young blind servant Oliver (Matthew Beard). Henry gives Elizabeth a tour of his substantial home, but warns her never to enter a mysterious room in the basement. The next day, with Henry away from home on a business trip, Elizabeth has trouble sleeping, and decides to defy her husband's warning, entering the forbidden room. There, she is horrified by what she discovers. To discuss the plot further would be to ruin the enjoyment that's to be found from its various twists and turns. I'm rarely impressed by plot twists at this point in my jaded movie viewing life, but Elizabeth Harvest boasts at least three that caught me by surprise, and which kept me hooked as to where Gutierrez was taking me with this story. 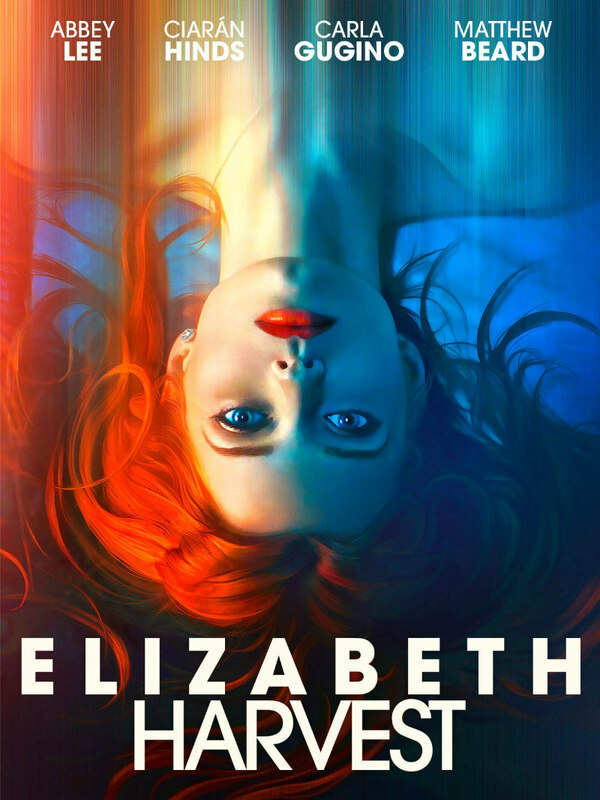 Despite its glossy cyberpunk stylings, Elizabeth Harvest is essentially a modern riff on Gothic horror, a movie about a young heroine who finds herself trapped in a remote castle by a mad scientist. You could imagine it being made in 1934 with Fay Wray and Lionel Atwill in the lead roles, and it moves with the pace of a classic Hollywood programmer. Largely appearing in roles best described as decorative, the jury has been out on the acting talents of former model Lee, but in her first lead role she's quite the revelation. The part requires Lee to play several versions of herself with subtly distinctive qualities that keep us from getting confused as to which one we're currently watching, and Lee manages to pull it off with a deceptive ease. As a director, Gutierrez has a similarly difficult task of making a story confined to one setting play in a cinematic fashion, but his film never feels stagey, and unlike many such movies, you never find yourself wondering if this might have worked better as a piece of theatre. His camerawork is subtle but graceful, as sleek as the interiors of Henry's lavish home, and cinematographer Cale Finot's shadowy lighting gives the film an appropriately neon-Gothic sheen. If you appreciate the sort of laser-focussed storytelling that's all too rare in mainstream American filmmaking today, Elizabeth Harvest makes for a satisfying thriller. And while Gutierrez has two decades of feature directing behind him, his latest film feels like the late blooming of an exciting talent. Elizabeth Harvest is on VOD November 13th.